The UrbanFurnishing.net's JOCELYN bathroom vanity collection features modern contemporary styling with ample storage in mind. 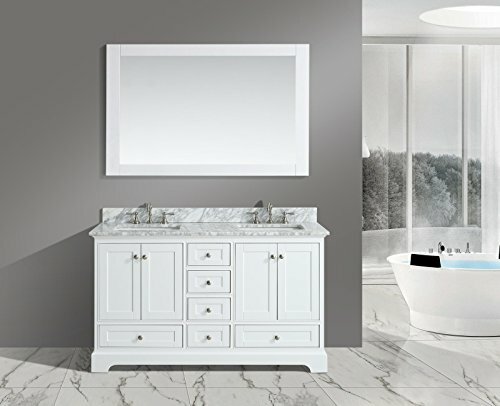 It boasts a glamorous Italian Carrara Marble Top with matching backsplash, framed mirror and rectangular undermounted sink. Constructed from premium solid oak wood with Dovetail jointed drawers, a distinguishing feature reserve for high end cabinetry. No Medium Density Fiberboard (MDF) are used, often found in lower quality vanities. Deep recessed compartments gives plenty of room to organize all bath essentials. Features brushed nickel hardware and stainless steel soft-closing hinge and slider on all drawers and doors. If you have any questions about this product by UrbanFurnishing.net, contact us by completing and submitting the form below. If you are looking for a specif part number, please include it with your message.